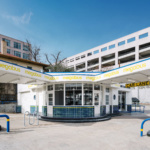 Derrington Building Studio's adaptive reuse project turned a 1940s Conoco station into a new Megabus stop in Austin, Texas. 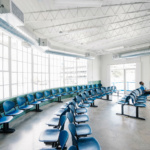 Tim Derrington, founder of Derrington Building Studio in Austin, Texas, opened his firm during the recession when he found it was easier to find clients than jobs. 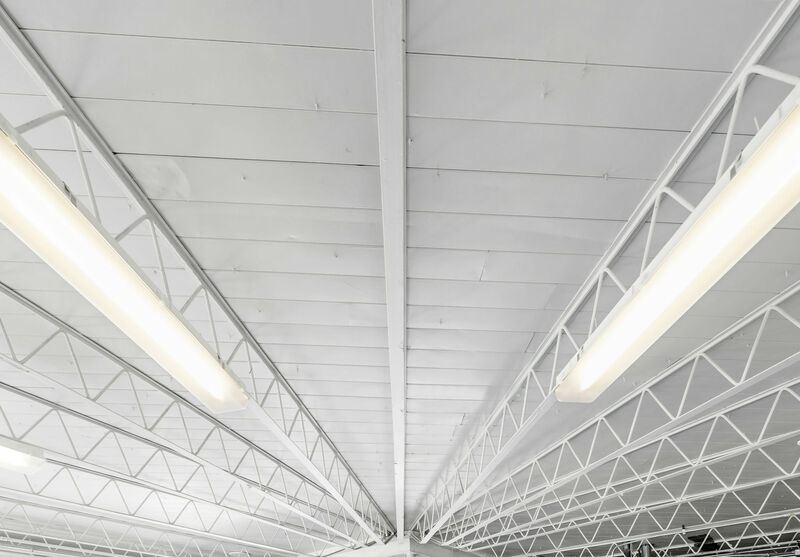 He said his studio’s work is modern in concept, but more regional vernacular in aesthetic and style, always playing off the context. 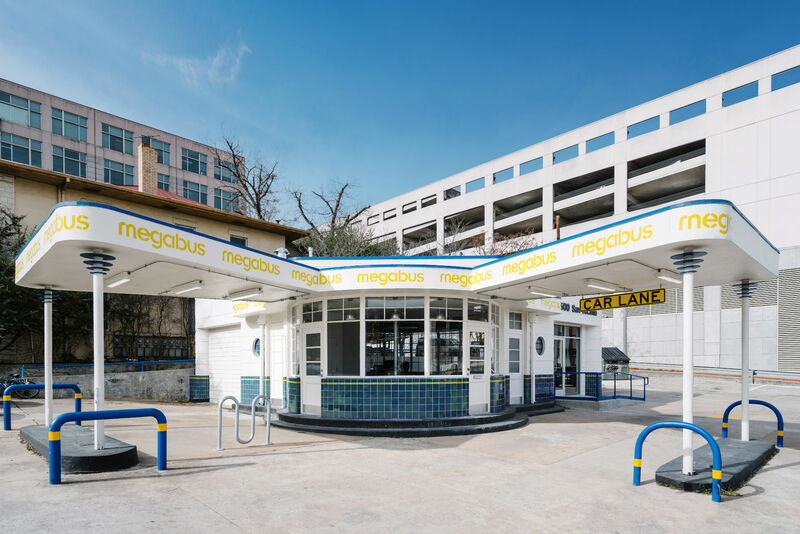 That rings particularly true in Derrington’s most recent project, the adaptive reuse of a small gas station into a Megabus station. “Everybody has driven by or seen that building,” said Derrington. “It’s prominent and it’s background at the same time.” (It’s located a few blocks from the University of Texas and the state capital.) 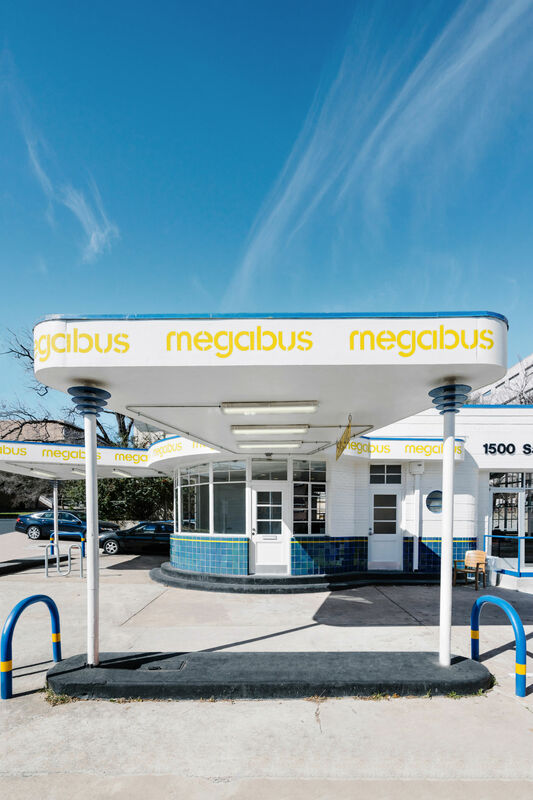 Built in 1941, it was originally a Conoco station that maintained much of its original character through the years. 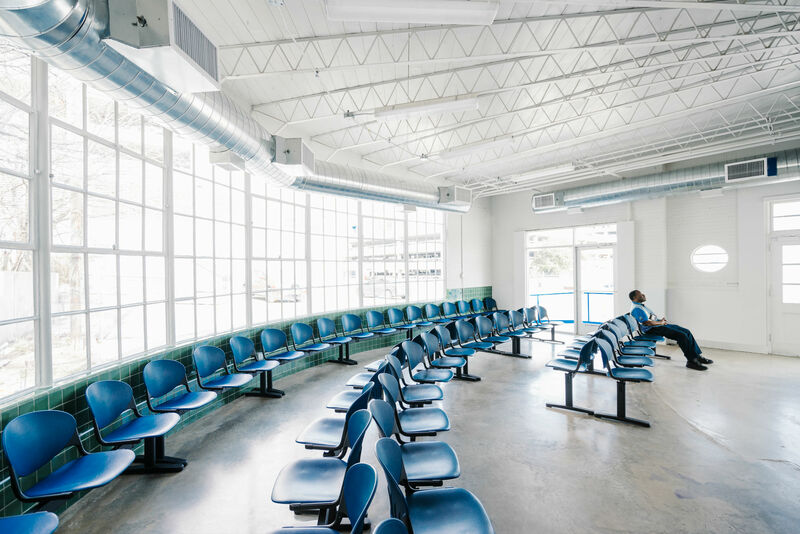 Derrington said that altering the building’s original exterior was out of the question; instead they would clean it up and celebrate its character. 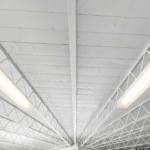 He felt it was important not to paint the building a bright color and insisted that the color white would accentuate the form and textures of the original structure. 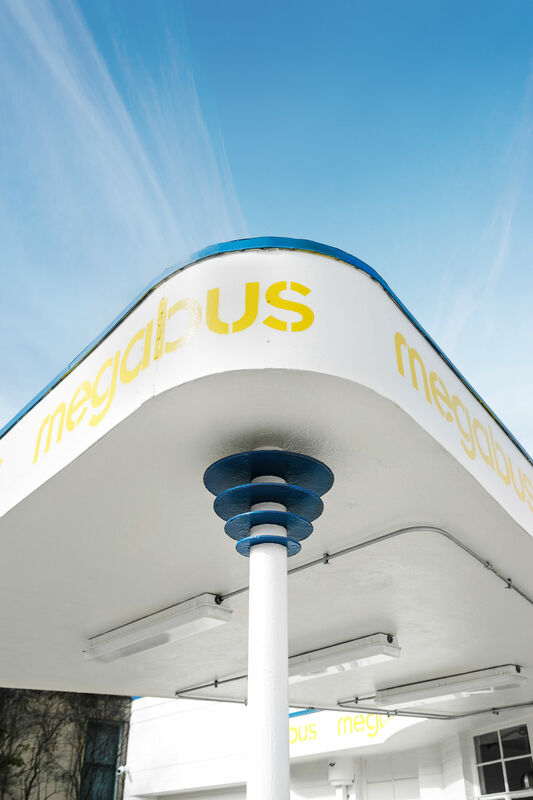 Luckily, Megabus agreed and the company’s bright gold and blue scheme became accents that played off the structure’s more retro elements. 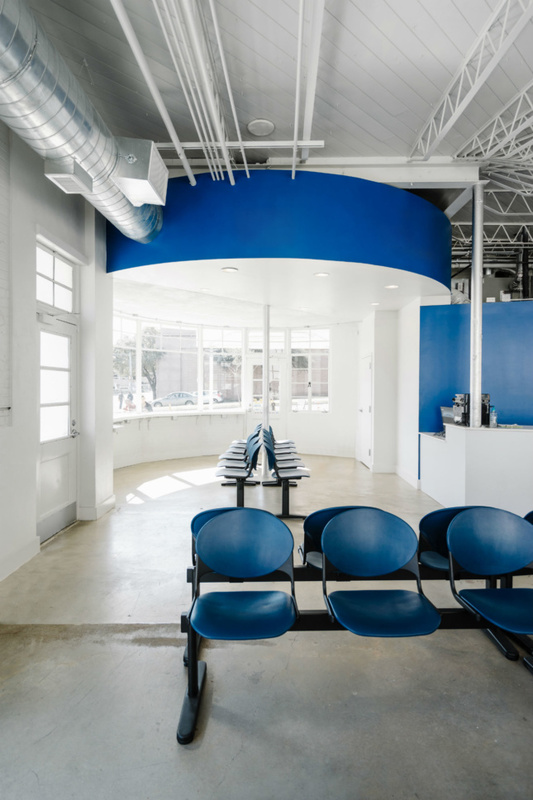 The blue, in particular, Derrington said, connects the building to its context by playing off the big blue Texas sky. “It almost painted itself,” he added. Preserving the original tile work on the exterior was also deemed non-negotiable. “The building owner’s wife fell in love with the tile and it was mandated that ‘thou shall not touch the tile,’” Derrington explained. “Nobody wanted to anyway, it’s just a neat little feature.” The tile already matched the new color scheme, so it was easy to incorporate. 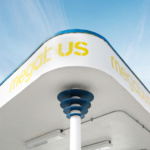 Of the many retro features the studio kept, he said the Jetsons-like rings around the tops of the columns were one of the more iconic elements that spoke to the building’s roots. 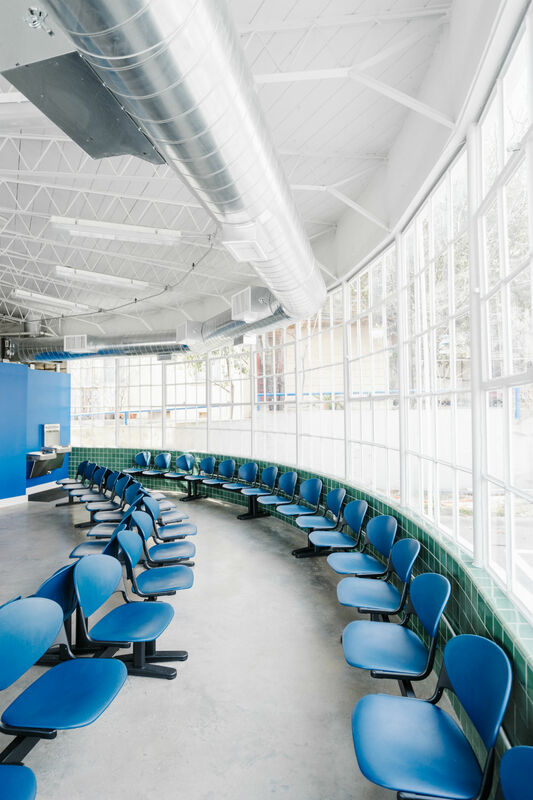 Although the quirky features like that give the building a lot of character, Derrington added that his favorite elements are the panoramic steel windows on the back façade. 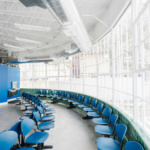 In order to keep the original windows, years of paint needed to be excised. “There were guys out there scraping for days,” he said. In the end, he said his studio was proud it could bring a diamond out of the rough. 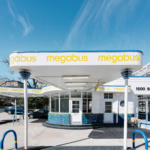 “The idea was to make this into something that is a desirable place, a nice place, to be so that bus travel no longer has this stigma,” Derrington said. 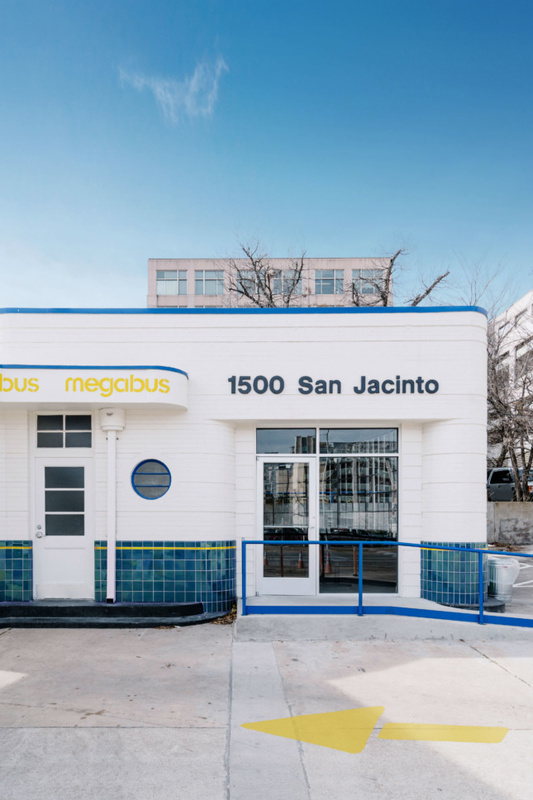 Now that the station is complete, the studio is moving on with several other projects in Austin, including a few homes, a school, and an extension to a rock-climbing gym they designed.